The forms and information you need to formalize dozens of estate planning and administration transactions, with the guidance you need to comply with Louisiana and federal law. 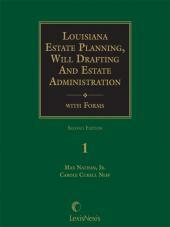 Louisiana is unique when it comes to estate planning, will drafting and estate administration. 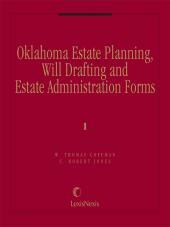 Just think of all the time you've spent over the years drafting wills, trusts, charitable bequests, tax returns, and dozens of other forms and pleadings that are part and parcel of Louisiana estate planning and administration. Louisiana Estate Planning, Will Drafting and Estate Administration with Forms is a master set of ready-to-adapt legal forms designed to save you hours of valuable time drafting your clients' documents. 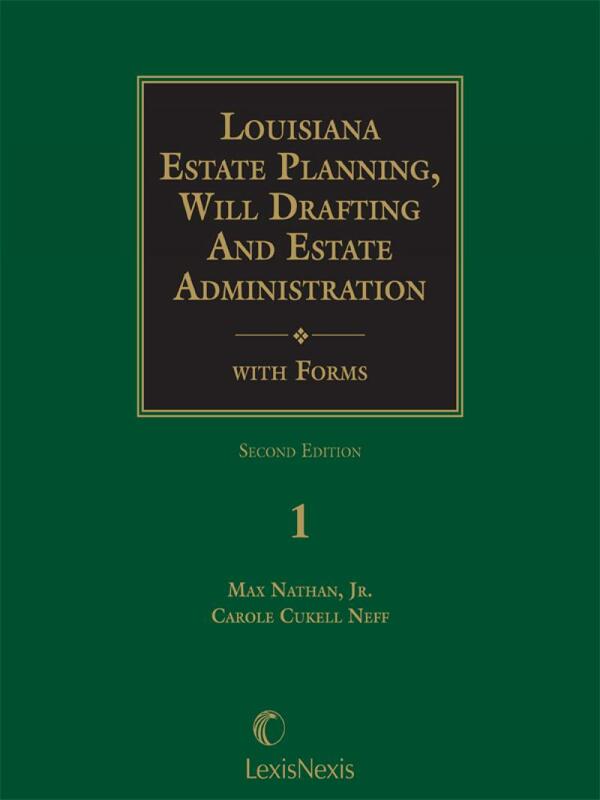 Here at last are the forms and information you need to formalize dozens of estate planning and administration transactions, and the guidance you need to comply with Louisiana and federal law. A comprehensive index puts the forms and guidelines you need at your fingertips fast. Max Nathan, Jr. practices primarily in the fields of estate planning, taxation and general civil law. He was president of the Louisiana Law Institute from 1998 through 2001, and is now the Chairman. The Institute is the official advisory law-revision commission, law-reform agency, and legal-research agency of the State of Louisiana. As a long-time member of the Law Institute's Council, he is a principal author of the current Louisiana legislation on partnership, successions, donations, and wills. 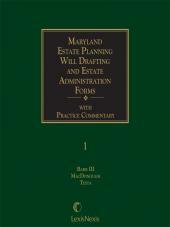 He is a member of the International Academy of Trusts & Estates and the American College of Trust & Estate Counsel. He is a Fellow of the American Bar Foundation and former president of the New Orleans Estate Planning Council. He served as chairman of the Mandatory Continuing Legal Education Committee of the State of Louisiana for six years, and was instrumental in implementing continuing legal education in Louisiana. He has been consistently listed in The Best Lawyers in America and in various Who's Who publications. 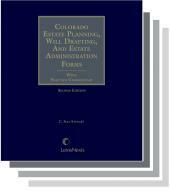 He is a board-certified specialist in taxation and estate planning and administration. Mr. Nathan is a Phi Beta Kappa graduate from Northwestern University. He graduated with honors from Tulane Law School where he was a member of the Tulane Law Review and a member of Order of the Coif. After graduating from law school, he served as a law clerk for Judge John Minor Wisdom on the United States Court of Appeals for the Fifth Circuit. 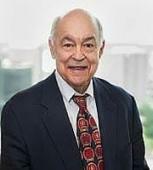 Mr. Nathan is a full professor at Tulane Law School, where he has taught on the adjunct faculty for 44 years, and has prepared his own coursebook on Louisiana secured transactions. Also, for the last forty years he has taught major portions of the annual bar review course for recent law school graduates. Ms. Neff is a Fellow of the American College of Trust and Estate Counsel, being elected the first woman and the youngest person from the State of Louisiana. She is the sole New Orleans representative of the Special Needs Alliance. Ms. Neff was recently named one of the ''Top Ten Attorneys in Louisiana'' by Super Lawyers of Louisiana. She was selected by Best Lawyers as the ''New Orleans Best Lawyers Non-Profit/Charities Lawyer of the Year'' for 2011. 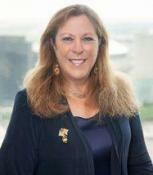 For many years she chaired the New Orleans Bar Association's Committee on Probate, Trusts and Estate Planning and has also served as President of the Women's Professional Council, President of the Professional Financial Planners of Greater New Orleans, President of the New Orleans Estate Planning Council, President of the Jewish Endowment Foundation of Louisiana. President of the New Orleans Rotary Fund, Inc. and as Chair of the New Orleans AVODAH Advisory Council. She serves as the Chair of the Louisiana Bar Foundation's Pro Bono Project, and on the Executive Committee of the Algiers Economic Development Foundation and the Jewish Federation of Greater New Orleans. She recently received the prestigious 2013 Michaelle Pitard Wynne Professionalism Award from the New Chapter of the Association for Women Attorneys. Ms. Neff is a frequent, sought-after speaker at estate planning seminars and institutes to fellow professionals and to lay audiences.